Wariki General Corporation was established to bring individual musicians, performers and composers together through traditional music and performing arts and to deliver unique productions to audiences around the world. 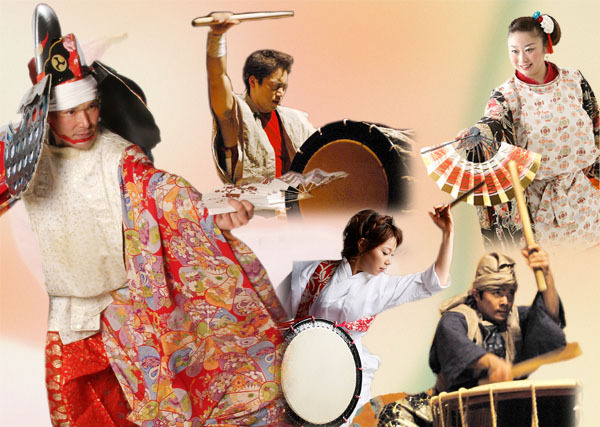 In Japan, oral and written musical traditions differ from region to region and amongst instruments. Depending on the local dialect, even identical pieces of music may be interpreted using different sounds or durations of sound. This has led some to conclude that these methods are esoteric and antiquated; however, we believe that these traditions are able to embody the natural essence of music before being transcribed into modern musical scores. We believe that music is the combination of human emotions with the melodies that flow in nature – such as the sound of wind, waves or rain drops, the footsteps or calls of animals, the flapping of a bird’s wings or the rustling of trees. Similarly, we believe that dance is born from the expression of human feelings of prayer and hopefulness with motions found in nature, such as the changing of seasons or the movement of plants and animals. Each performer has unique instincts of space and time in music and dance. We believe that it is in capturing this diversity that the performance comes to life. Wariki strives to compose dynamic relevant renditions of traditional music and stage productions through the growth and self-discovery that come from understanding and respecting one another’s gifts – this is the philosophy behind Wariki. Akira Katogi (drummer, dancer, and Dai-do-gei traditional Japanese street performance) joined forces with Shunsuke Kimura (Japanese flute and tsugaru-shamisen player, composer, and music director) in 2001. Since then, they have continued to explore the possibilities of transforming traditions such as ancient ceremonies and festival arts into a stage performance art. In 2005 Wariki welcomed Etsuro Ono (Shamisen player and composer) and together they have presented works with a greater emphasis on the art of narrative in a style we have come to call Oto-mai-katari, integrating music, dance and storytelling. 2001 Akira Katogi and Shunsuke Kimura establish Wariki. 2005 Etsuro Ono joins Wariki. Performed as one of 18 groups of Japanese traditional performing arts to be specially featured at World EXPO in Aichi, Japan. 2006 Performed at the Whitehall Theater, London (sponsored by Agency for Cultural Affairs) and the Pitti Palace in Florence (a World Heritage site), Italy. 2008 Performed in New York and in Los Angels, USA. 2009 Performed at The National Folk Museum of Korea, Seoul, Korea. 2010 Performed in Slovenia, Serbia, Montenegro. 2011 Tour - Serbia, Bosnia and Herzegovina, Albania, Kosovo. 2012 Tour - Serbia, Bosnia and Herzegovina, Slovenia, Albania, Kosovo. 2013 Wariki became a General Corporation. 2016 Performed in Seattle, USA. 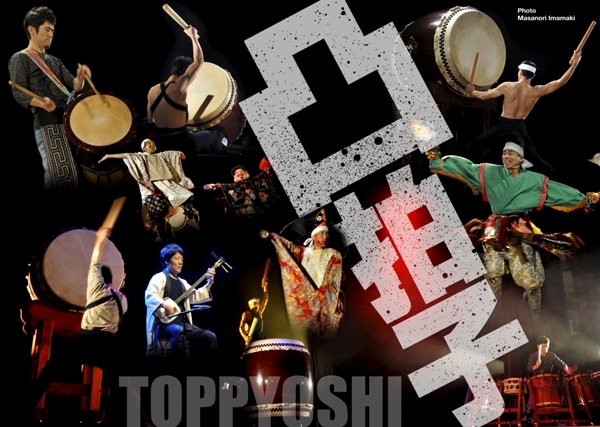 Toppyoshi is a concept that involves taking the forefront and letting go, unreservedly expressing oneself through one’s performance rather than blending in. The more bold and distinct a performance is, the greater the inspiration for others to reciprocate. Wariki’s Toppyoshi is a production that combines the distinct charms and talents of Akira Katogi, Yu Imafuku and Tetsuro Naito. 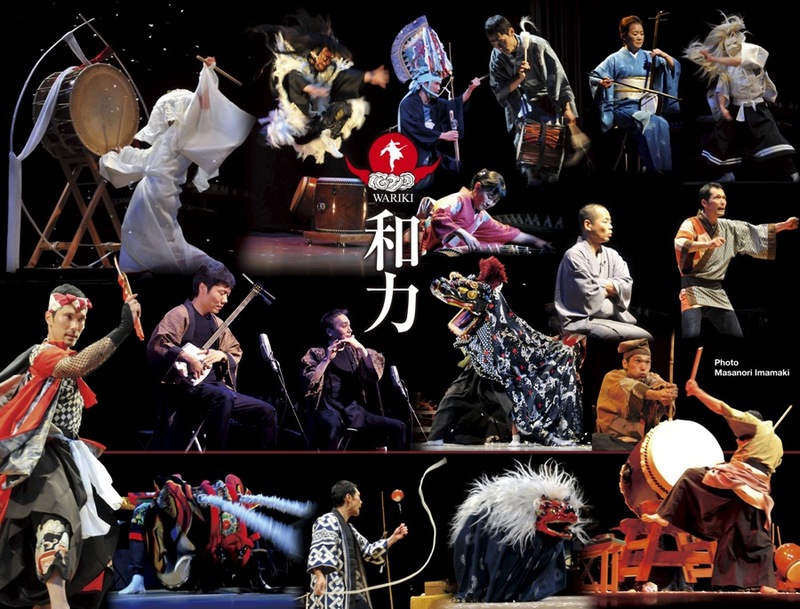 Wariki primarily features taiko drums known as Kurinukido and okedo. Kurinukido taiko are drums carved from a single piece of wood with skins tightened and fastened by tacks known as byo. Okedo taiko are drums of stave construction with skins mounted on metal hoops and tightened to the body by ropes. Compared to other instruments, the drums are rather simple in design. However, subtle adjustments and modifications to the drums, such as the shape and thickness of the body or the treatment and tightness of the skins, can produce a variety of different sounds. There are also many methods of playing the drums by altering how they are mounted on stands or by carrying them on the body. This allows for the instruments to be incorporated into a variety of music and dance. 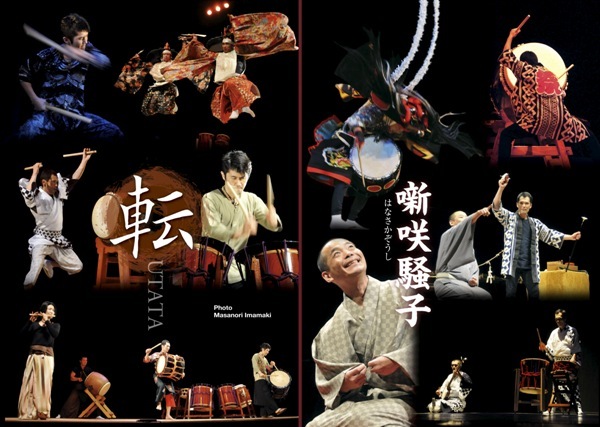 Akira Katogi, together with taiko performer Tetsuro Naito, continue to reaffirm the boundless potential of taiko in their productions. In Japan there are a variety of narrative performance styles such as kyogen, rakugo, daido-gei street performance and even the clever calls of merchants peddling their wares in the market. The power of the spoken word is amazing in its ability to make us feel happier or even loosen our purse strings. Anything goes in “Hanasakazoshi”, as Akira Katogi combines his taiko and shishimai lion dance with the jokes, wit and lyrical artfulness of comic storyteller Sanjyaku Yanagiya. In response to Akira Katogi’s declaration, “Let’s make traditional performances that react to today!” the group ‘Kanau’ was born consisting of renowned performers from the Tokai region. The arts have a tremendous ability to stimulate our imagination and emotions. Kanau captivates audiences of all ages with productions that are rooted in tradition but continue to stretch the boundaries of the performing arts.